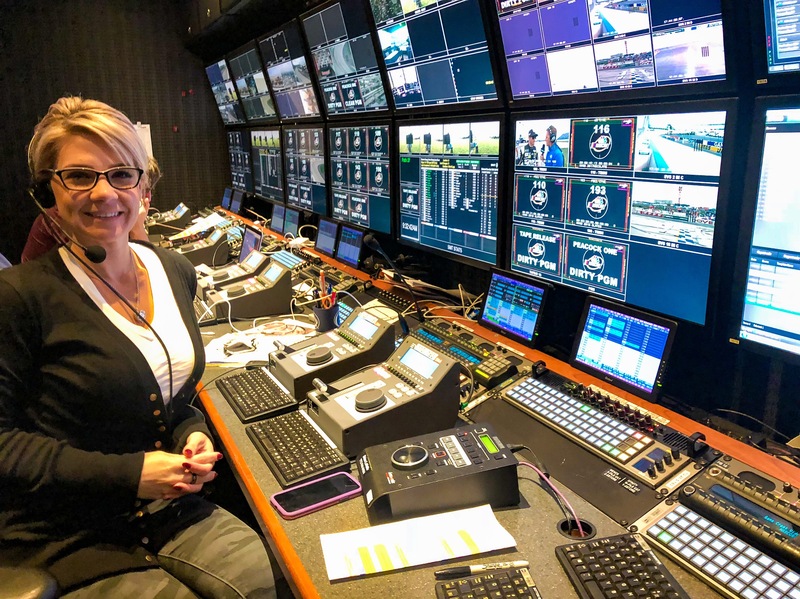 During last month’s NASCAR race at Dover, a professional milestone achieved by veteran replay operator Trish Dakshaw turned out to be a groundbreaking moment. With Tom Ginocchi, NBC’s lead replay operator for NASCAR, out for the race, Dakshaw took his place in the “big chair” — and took her place as the first female lead replay operator in NASCAR broadcasting history. A Pennsylvania native, Dakshaw grew up going to Pocono Raceway and hoped to one day transition her love of motorsports into a career. She worked her way up the ranks from production manager for smaller races to the second-in-command replay operator on NBC’s NASCAR schedule. In 20+ years in motorsports, Dakshaw has won several Emmys for her technical work on ESPN’s NASCAR coverage, but it is this accomplishment that truly stands out to her. Trish Dakshaw in the replay room at Dover. Chad Drain, Dakshaw’s husband and a camera operator on NBC’s NASCAR coverage, took the photo. This weekend, in Texas, she will get her chance in the big chair once again. SVG sat down with Dakshaw to discuss her experience in Dover and preparations for Texas, what drew her to a career as a replay operator, and how she hopes putting “a little crack in the glass ceiling” will help the next generation. The majority of your career has been with motorsports. Were you a fan of NASCAR growing up? Ever since I was a little kid, I always had a thing for vehicles: monster trucks, mud bogs, pretty much anything with an engine. I grew up changing the oil on my car with my dad, and my grandfather was a mechanic, so it was kind of in my blood. I started going to these NASCAR races as a fan, and I can remember being in the stands at Pocono. I watched it for years in high school, and I wanted to go into racing, so I started in American Le Mans Sports Car racing, did some World of Outlaw Racing, dirt-track racing, and just kind of worked my way up. One job leads to another job, and here I am. I’m originally from Pennsylvania, but my father is an engineer, so I grew up all over the country. Every two years, I would move and change schools, so I learned to become pretty resilient, which is probably a good thing in racing. Racing is a male-dominated industry, so you have to have tough skin. Going to a different school every two years, you get that tough skin. I think that helped me. I’ve been told a couple times girls shouldn’t be in racing or “You’re not going to make it because you’re a girl.” Anytime you tell me I can’t do something, it’s a surefire bet that I’m going to go do it. How did your career in racing begin? I started as a production manager; I would hire the crew, deal with all the vendors, deal with travel, deal with hotels, all that kind of stuff. Then I figured out that I wanted to be a little bit more technical in the actual show production. I’d produced and done some tape producing before, but I found my niche in the tape room as an EVS operator. I worked my way up the ranks. Fortunately, I’ve been able to catapult that into World Series of Poker, hockey, basketball, all the professional sports, so, when the racing season is over, I do a bunch of other sports. What is it about working in the EVS room as a replay operator that most appeals to you? To be honest, it’s the crew that I work with. Everybody has had those jobs where they dread getting up to go to work — I’ve had them myself — but this is totally different: this is a great experience. It’s an amazing group of people; they’re all professionals from the moment they put their shoes on in the morning until they go to bed at night. I couldn’t ask for a better crew. And my immediate boss, Tom Ginocchi, has been a mentor of mine for a number of years. I attribute a lot of the opportunities that I’ve had, the experience that I’ve gained, and the education that I’ve gained to him. He’s the reason I was able to do this lead tape position now. Tell me about when you found out you’re going to be lead replay operator in Dover. How did you prepare for that, and how was the experience? Well, it was a little nerve-wracking because it is a big show. Most people don’t realize it’s pretty much the size of a Super Bowl show every week in the number of record channels and the crew and the staff. Granted, we don’t have the hoopla that obviously comes with the Super Bowl, but the day-to-day workings are about that size. For the past year and a half, I’ve been really working with Tom to understand what he does between the media management, the crew management, the technical management, all that comes into it. Fortunately, I work with a great crew that was never going to let me fail. Not that I would have, but, when you have a great crew that raises you up, I never felt like anything bad was going to happen. I always felt like everyone had my back. It’s just unique because I’m the first woman in 30 years of NASCAR broadcast history to do this job. When I finally stepped back, I [realized] Wow, there’s a lot of eyes on me, the new person doing the job. But it was also that, sometimes when you’re a woman, you feel like you have to prove yourself a little bit more. That’s how I went into it. I did my job, I did it well. I always try to do it as a professional, and, as long as I stick to that, I feel I’ll always succeed. I just looked at it like that. I took the bull by the horns, took all my experience and education that I had — I’ve done lead on other shows, just not quite as big as this one — and just plowed through it. Were there any unexpected challenges or elements of the experience that you didn’t expect? In the EVS room, we do all the replays and everything, but all that media that the cameras are shooting, that we’re recording and making clips of, and all the digital information that comes in get shipped down all these different pipelines to different outlets — NASCAR; NBC in Stamford, CT; Fox get what we get — so everybody can build and edit. I didn’t realize how much our information went everywhere so that was a little bit of an eye-opener. I wasn’t nervous about doing the replays or the live side of anything because I’ve been doing that for 20 years, and so has my room. It was just a matter of making sure everybody’s media gets where it needs to go; if it doesn’t, you hold up other shows. And then dealing with the computer side of it and the media-management side, where there might be some kind of little technical glitch, you have to work through that. You don’t know what’s going to sneak up on you, but something always seems to. You just have to roll with the punches. Fortunately, again, I worked with a group of great people, so I felt like I was in control and any problem that came up was solvable. You’re going to be lead replay operator again at this Sunday’s NASCAR race in Texas. Have you prepared any differently for this weekend? I continued shadowing under Tom Ginocchi for two weeks, taking my notes, sitting doing the reps — the actual physical work and the media management. Getting seat time in is a big deal, so, for two weeks, I did that. It was like Tom wasn’t there and I’m doing the job, but he was there as a failsafe. In Texas, I’ll be in the big chair. It’s cool to be doing this during the playoffs. It’s one thing to be doing a summer race that nobody’s really paying attention to, but now we’re at Texas; that’s only two races to the end. A lot’s on the line: a lot more eyes are watching, there’s a lot more advertising dollars. The stress is a little bit higher for Texas, so I’m just trying to understand everything I have to do and button up and tighten up and just do the best I can. Does being the first female lead replay operator for NASCAR go through your mind, or is that not really a factor when you’re doing your job? For most of my time going through this business, more times than I can count, I’ve been the only woman on a crew. The woman part I always put aside and just do my job. No one really cares at the end of the day male or female, as long as you just do the job. It wasn’t until I was talking to our production manager and our tech manager that we all kind of realized, Hey, first woman to do this, that’s kind of neat. I didn’t think about it until it was brought to my attention, but it is kind of cool anytime you can be the first at anything and then, of course, as a woman. I don’t know if I can say I’m breaking any glass ceilings, but I think maybe I put a little crack in one, and I’m helping out the next woman coming up. It’ll be a great day when nobody has to be “the first woman that did this”; it’ll just be “the person did this.” But that’s not the world we live in, so, if I can help crack that glass ceiling a little bit, it’s great.